It is a fivefold conceptual scheme that many traditional Chinese fields used to explain a wide array of phenomena, from cosmic cycles to the interaction between internal organs, and from the succession of political regimes to the properties of medicinal drugs. 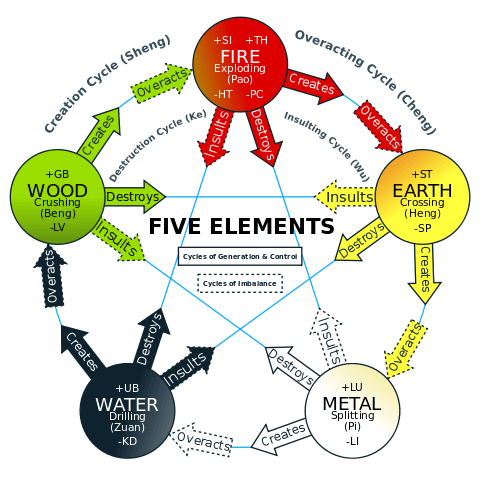 The “Five Phases” are Wood (木 mù), Fire (火 huǒ), Earth (土 tǔ), Metal (金 jīn), and Water (水 shuǐ). This order of presentation is known as the “mutual generation” (相生 xiāngshēng) sequence. In the order of “mutual overcoming” (相剋/相克 xiāngkè), they are Wood, Earth, Water, Fire, and Metal. Based on a particular directional energy flow from one phase to the next, the interaction can be expansive, destructive, or exhaustive https://en.wikipedia.org/wiki/Wu_Xi. A proper knowledge of each aspect of energy flow will enables the Acupuncturist to re-balance the flow of energy in the patient’s meridians. For example someone with severe migraines might need the energy in the Liver meridian soothing, someone with saddness post-miscarriage might need their Heart energy nourishing, and other times 5 Element Acupuncture can be used to help heal the Spirit. When the five elements are present within us in a balanced and harmonious state, we experience health, well-being and the joy of being alive.